Danyelle Khmara Margo Cowan speaks to a crowd of immigrants, their families and volunteers at the Keep Tucson Together legal clinic at Pueblo Magnet High School on Dec. 15. Cowan began that week’s clinic, which offers free legal assistance on immigrations issues, by telling the crowd they have rights, and despite the incoming president Trump, they are not going anywhere. Danyelle Khmara Karla Stahlkopff has been coming to the clinic for over two years, ever since her husband faced deportation after being pulled over because of smoke emitting from his car. The clinic has helped them have temporary relief from worrying about deportation. Danyelle Khmara Mical Alvarado Diaz volunteers with Keep Tucson Together at Pueblo Magnet High School, helping people attain Deferred Action for Childhood Arrivals. A DACA recipient herself, Alvarado Diaz said she, like other Dreamers and their families, are prepared to stand up against possible threats a Trump administration may impose. People gather around Pima County Public Defender Margo Cowan, as she tells them, unequivocally and in perfect Spanish, that they're protected. "Tell everyone," she says to the crowd of around 200 in the Pueblo Magnet High School gym, only the hint of an accent revealing Spanish isn't her first language. "We are protected. Everyone has constitutional rights." Cowan, who's practiced immigration defense for 45 years, is the supervising attorney for the volunteer-run Keep Tucson Together legal clinic, which offers assistance for an array of immigration concerns and meets weekly at the south-side school. 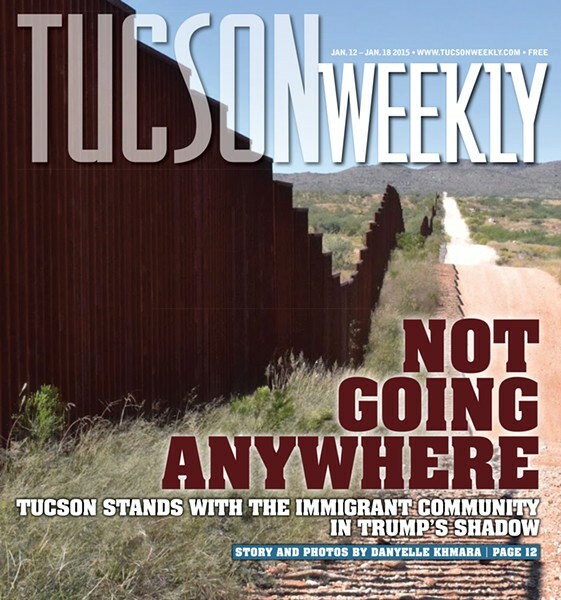 Since Donald Trump won the presidency, after repeatedly promising mass deportations, many in Tucson's immigrant community are concerned for themselves and their loved ones. However, allies have stepped up efforts to protect immigrants' rights and well-being. "We have to mobilize because we have to defend ourselves," Cowan tells the crowd. One of the clinic's volunteers Mical Alvarado Diaz, 21, is a recipient of Deferred Action for Childhood Arrivals, President Barack Obama's 2012 immigration policy that grants certain undocumented immigrants brought to the U.S. as children a renewable two-year period of deferred action from deportation and permission to work. As well, in 2015, the Arizona Board of Regents granted DACA recipients, commonly referred to as Dreamers, the right to pay in-state tuition at public colleges. When Obama started DACA, Alvarado Diaz was excited because it meant she could afford to go to college. Three years ago she got help with her DACA application at the Pueblo High clinic and has volunteered there ever since, helping other Dreamers. In-state tuition is often a third the cost of out-of-state, and Alvarado Diaz, who is studying to be a nurse, is able to pay for her education through scholarships and part-time jobs. On the campaign trail, Trump vowed to rescind DACA and can easily do so. So when he won the presidency, Alvarado Diaz's future became uncertain. "I was super sad, and then I was super angry, and I was really worried," she said. "But right now, I'm just sort of to acceptance at this point. We've gone through this before; we'll continue to fight against it." Alvarado Diaz was born in Ciudad Juárez, Chihuahua. As a young child, she frequently visited her mother's family in Tucson, where her father often had work. She was about to start kindergarten, and Juárez was becoming infamous for its rise in violent murders of women and girls. Worried for her safety, her parent brought her at 6-years-old to Tucson on a visitor visa, and they've lived here ever since. She has a 17-year-old brother who's also a Dreamer and an 8-year-old brother who was born in the U.S. Her parents are still undocumented, and she worries about them. "Anything minor and they could be stopped, and I don't know if they'll be coming home," she said with tears in her eyes. America is a country of immigrants, and the tremendous contributions DACA recipients and their parents have made through their sweat equity gives them a right to be in the U.S., Cowan said from her downtown office of the Pima County Public Defender. "DACA was not created by President Obama," she said. "DACA was created by Dreamers all over America and their families saying, 'Hey, we might not have a piece of paper that says we were born here, but we're Americans through and through.'" As of June 30, 2016, roughly 741,500 young people had received DACA, according to U.S. Citizenship and Immigration Services, a component of the Department of Homeland Security. The University of Arizona has an estimated 70 DACA students, studying in a variety of fields, according to the college's Immigrant Student Resource Center. Pima Community College has 517 DACA students, according to PCC spokeswoman Libby Howell. Both colleges have put out public statements assuring their continued support of DACA recipients. According to a September survey conducted by the Center for American Progress and other progressive think tanks, human-rights advocates and political scientists, DACA has had a positive economic impact on recipients and the U.S. economy, as Dreamers increase their salaries and buy cars and homes, contributing to sales and property taxes. They also start businesses, creating jobs and economic growth. "The suggestion that somehow these people would be demonized, and they would be targeted for removal—they're not going anywhere," Cowan said. "I dare you to target them because people love them. They're the golden kids. And it's not because this group is anything different than any other group of immigrants that have come to America and made tremendous contributions." Karla Stahlkopff moved to Tucson from Sinaloa in 2000. At 20-years-old, she was fleeing violence and looking for a better life for her newborn son. Two years ago, after 14 years in the U.S., she started coming to the Keep Tucson Together clinic after her husband was almost deported. His undocumented status became an issue during an unrelated traffic stop. Facing deportation, he sought sanctuary at the Southside Presbyterian Church where he stayed with Stahlkopff and their then 13-year-old son for a month before receiving a hold on his deportation case. Now her husband has documentation allowing him to stay, for which they return to the clinic to renew yearly. But since Trump won the election, Stahlkopff feels an anti-immigrant sentiment has become more prevalent. She doesn't feel as safe going out of her house. "It's not just my family that's afraid right now, it's millions and millions of families," she said in Spanish. "If we leave the house to go about our normal lives—to take the kids to school, to simply go to the store and stuff like that—you can't leave your house anymore. Why? Because they might detain you." The We Stand Together network, initiated by the Southern Arizona Hate Crimes Task Force and hosted by the YWCA Southern Arizona was launched in response to a spike in hate crimes, said Kelly Fryer, CEO of YWCA Southern Arizona. "One of the things that has happened as a result of this election is it's become clear that we really all need to stand together against oppression, bias, harassment, hate of any kind," Fryer said. "I need to support you, and I need you to support me as we face it together." The goals of the network are to enlist businesses and individuals as safe places for anyone experiencing harassment, to educate people in understanding differing cultures and viewpoints, and to stand together as a community. Being a "safe space" means giving shelter to anyone experiencing bias-related harassment as well as speaking out against prejudice. All who join the network receive a decal to put in their window, by their door or on their belongings to signal their commitment. As of Dec. 27, 533 businesses and individuals had joined the network. Included is every public building in the county, voted to join by the Pima County Board of Supervisors, Fryer said. The YWCA will also be hosting trainings and workshops. "Nonviolence and Activism: Organizing for Social Change," scheduled for Jan. 14, filled up within a couple days, she said, adding that there will be more such events soon. "Different groups in the community can kind of get to know each other a bit more, so that we can really authentically have each other's back," Fryer said. "To really stand together, not only against incidents of harassment that are maybe being inflicted on neighbor by neighbor, but to be prepared to respond in the event that those things become official policy of the United States government." Tucson has a number of human-rights groups that began to spring up in the early 2000s in response to the growing number of migrants dying while crossing the desert of the Arizona-Mexico border. No More Deaths, Tucson Samaritans, Southside Worker Center, Protection Network Action Fund and the Kino Border Initiative are just a few such groups in the Arizona borderlands, working for migrants' rights and wellbeing. They plan to continue under President Trump and to work on being a stronger national voice. The Southside Worker Center and community allies are developing a rapid response strategy, which may include a 24-hour-help hotline, group texts and a database of emergency contacts for families at risk of deportation, said Sarah Roberts, Worker Center volunteer and board member. Some of the actions local groups plan to ramp up or implement include: non-violent direct-action training, looking for allies in Congress and bringing people of influence to the border. A few of the steps they're asking of U.S. Customs and Border Protection include: administrative oversight, transparency, and adequate training to ensure legal and humane dealings with asylum seekers and undocumented immigrants; ceasing the separation of families during deportation; reducing the detention length of migrants caught entering the U.S. illegally; and reducing the use of expedited removal. "We have seen, first hand, the humanitarian crisis created from the border enforcement strategies that Trump would like to accelerate in a way that we've never seen before, and so we are trying to prepare ourselves to be able to do advocacy work" said Maryada Vallet, No More Deaths volunteer spokeswoman. "As a community we feel ready to respond and resist, and we will do so." Mayor Jonathan Rothschild and Vice Mayor Regina Romero reaffirmed at a press conference on Dec. 20 that Tucson is an immigrant-welcoming community. Rothschild stated that Tucson will continue to protect the civil rights of all its residents, although no tax payer money will be committed toward legal help for undocumented immigrants, like cities such as Chicago, Los Angeles and New York have in the works. Following the press conference, the City Council unanimously backed a resolution, drafted by Romero, calling for humane treatment of all people, regardless of their immigration status, and condemning any practices that do otherwise. "We, as a community, have very specifically stated that we protect our residents, whether documented or not," Romero told the Tucson Weekly. "That we will not let TPD participate or collaborate in any deportation of any of our residents, that we believe in human rights and dignity for all." In mid-November, Tucson Police Chief Chris Magnus released a statement saying there would be no change in the Tucson Police Department's dealings with the immigrant community, adding that TPD will not take on the federal responsibility of immigration enforcement, despite Trump's pledge of mass deportations. TPD's current migration policy states they may not stop an individual unless they are believed to be involved in a crime, but they may attempt to determine immigration status if there's a suspicion the person is undocumented. Incoming Pima County Sheriff Mark Napier, who begins his term on Jan. 1, told the Tucson Weekly he plans to follow Magnus' lead and make no changes to the Sheriff's Department's current policies. We're going to have to get past this election and do the right thing for all people, Napier said. Cowan jokes that before Trump, she'd been thinking about retiring, but not anymore. She does so much pro-bono work because it's the right thing to do, she said, adding that it's an honor to stand with the families she helps. "These are our neighbors," she said. "There's not a 'them and us' in America; there's an 'us.' And we have an obligation to not permit these kinds of things to go forward in our name."